We stayed in Silver City until 3pm when it cooled off. I was hoping for our first full zero day (no miles hiked day) because I bounce myself (a box you send to yourself repeatedly on trail) my laptop every few weeks to upload photos and videos from each section. Checkout was 11am, so I ended up staying up til midnight last night and then getting up at 5am to finish everything I had planned to do over a full zero day. Good thing I require little sleep! We haven’t taken a zero yet, but feel good because we’ve had some long neros instead. That saves more money and keeps us on trail. We had lunch and hung out a bit before leaving in the late afternoon. We are getting differing information on the water sources ahead so we are hoping there is water a few miles from here tomorrow. If not, we’ll stretch what we have to the next source. This year is so dry that many of the regular sources are dry, so we have to carry enough to the next source if needed. The first 6mi out of town was another paved road walk, ouch! I calculated it, and this far, 14% of the hike has been a paved road. 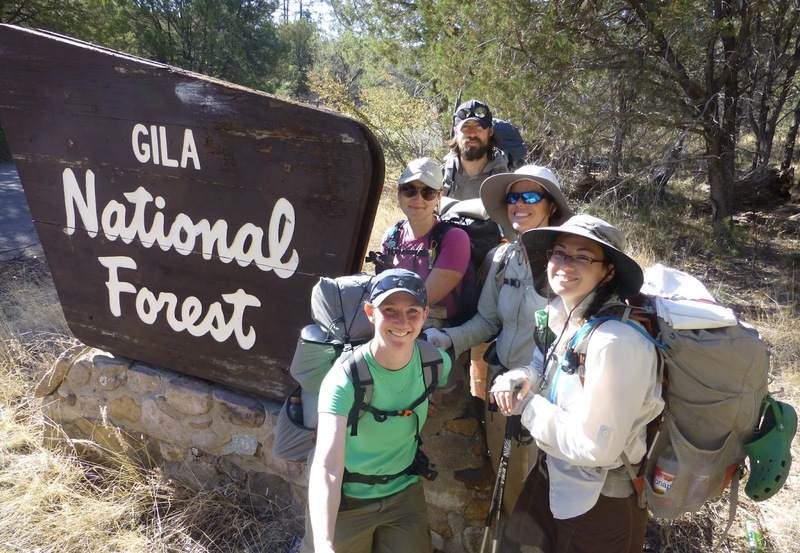 Toward the end of that road walk, we officially entered the much anticipated Gila National Forest. We are all very happy about this and have heard it’s a highlight of the hike. We hiked a few miles into the wonderfully forested area along a now packed dirt road. We officially diverged off the “official” CDT for the first time. 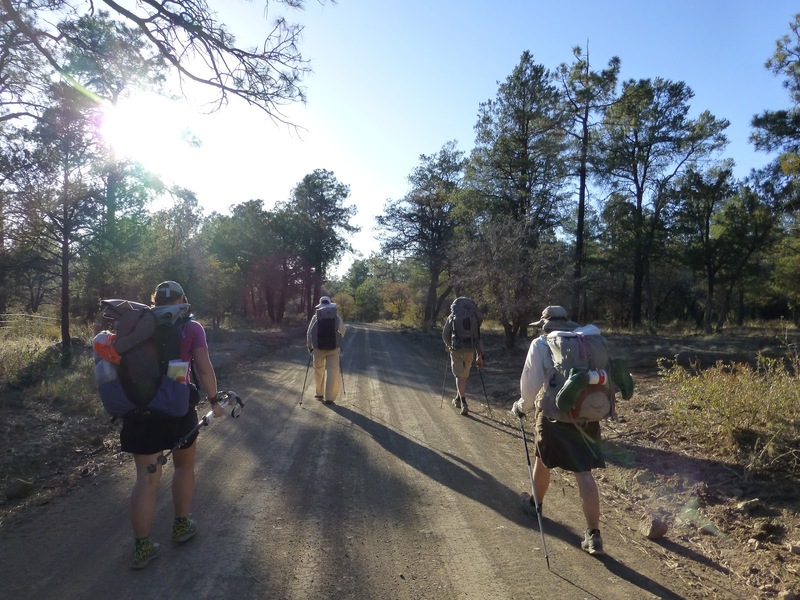 The Gila route is what they call an “alternate route.” The CDT has many of these options and it’s kinda like a choose your own adventure. The Gila is one of the most highly recommended alternates. The other route is much longer, more challenging, and dry for 50mi. Balls, Sunshine, and Beacon are doing the official route since she is looking to officially set the record for youngest triple crowner. Her birthday is tomorrow and she will be turning 13, wow! We hope to converge in northern New Mexico and this is one of the sections where you can look on my Where’s Wired tab and see our location dot inch closer to theirs. Fun! We found a nice spot to camp and everyone decided to cowboy(camp without a tent) except me. I’m way too scared of creepy crawlies and like being in a shelter. We heard there is a big cold snap coming across New Mexico and that temps could drop below 30 and remain cooler during the day. Of course this is the section where stream crossings occur. They are minor this year with the low water, but might be pretty cold if the temps shift as drastically as is predicted. This will be the perfect opportunity for me to test out my tent and sleeping bag in the cold. I’m interested to see how warm I stay. 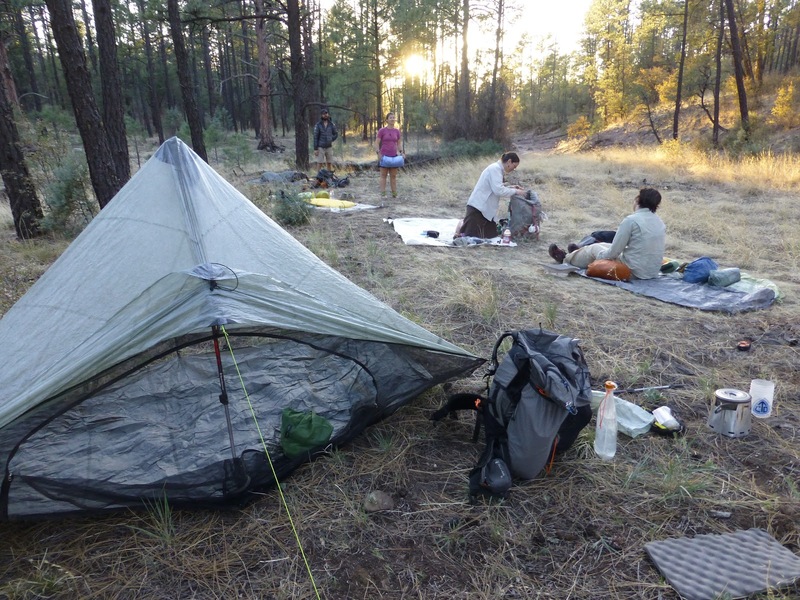 Many of you have asked about the new ZPacks Hexamid tent and how I like it. I’m very close to getting my old tent back, but trying to adjust to this one. It takes me longer to set up, feels more drafty and less protected, and has less space inside. Tonight was my first night setting this tent up perfectly on the first try. I’m getting the hang of it. My new sleeping bag does not have a hood, so I have my beanie on and my down jacket with the hood up. It’s a good test run and I hope it works out. Every other night has been so warm, that I’ve been using the bag as a blanket. The night is extremely still and silent tonight and we can hear wolves way off in the distance. I’m camped with tall trees all around me and my tent is on top of long pine needles. For the first time on this hike, I’m not camped around cow pies(dung). It was easy to dig a cat hole. I’m a very happy camper tonight. Enjoy your journal. It contains the most thorough observations about the CDT. Oh thank you! I am surprised over the years, something more current hasn’t popped up, but I understand the toll keeping it can have out there. Glad it’s still being put to use!